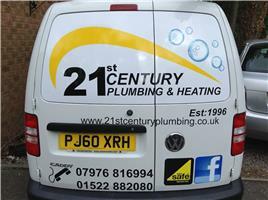 21st Century Plumbing & Heating (Lincoln) Ltd - Central Heating Engineer based in Lincoln, Lincolnshire. 21st century plumbing was established in 1996 as a partnership with my dad who was a lecturer at Lincoln college teaching plumbing and I had experience in pipe fitting and commercial pipework. We worked together for about 10 years and then my dad took retirement. I have been building my business since then we pride ourselves in providing a quality service and building a good repour with our customers.